The global solar market installed an impressive 98.9 gigawatts of new capacity in 2017 according to SolarPower Europe, increasing by 29.3%, in comparison to the 76.5 gigawatts (GW) and 49% recorded in 2016. SolarPower Europe presented its latest solar market data at the recent SolarPower Summit held in Brussels, Belgium, late last week. Total global solar power additions increased by 29.3% in 2017 and amounted to 98.9 GW worth of new capacity — falling just short of SolarPower Europe’s October prediction that the market would for the first time reach 100 GW. For Europe specifically, the solar market grew at the same growth rate, with 8.6 GW of new capacity in 2017, up from the 6.7 GW installed in 2017. Looking at Europe specifically, SolarPower Europe found that Turkey was the largest European solar market in 2017 with growth of 213% year-over-year, installing 1.79 GW. Germany was second with approximately 1.75 GW, and the UK followed in third. 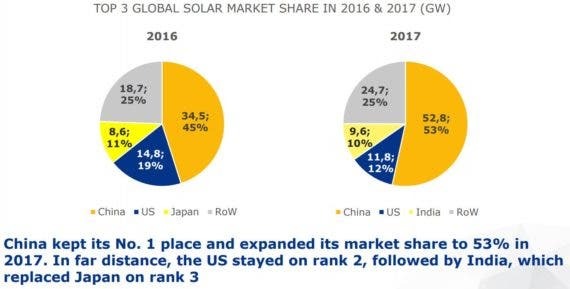 SolarPower Europe also highlighted the growth outside of Europe as well, revealing that China and India together accounted for 63% of total solar demand in 2017. China’s National Energy Administration announced in January that it installed 52.83 GW in 2017, up from 34.5 GW in 2016, well away from the next closest competitor, the US, which installed 10.6 GW, and followed by India with 9.6 GW. “Solar’s continued growth is great news as we move the global energy transition forward — but Europe is at risk of being left behind,” warned James Watson, CEO of SolarPower Europe. “The EU must ensure that it addresses obstacles to solar’s potential, such as barriers to self-consumption and it must ensure a strong framework for small scale solar.